Our product range includes a wide range of fork stacker, electric pallet stackers, hydraulic stacker, hydraulic bag stacker, hydraulic jacks and hydraulic hand stacker. Precision offers Fork Stacker is designed for safe and efficient way out for endless material application at distribution center, logistics company and other industries. The entire range is fabricated using latest technology and qualitative material. It has the Capacity 1000 / 1500 kg. Lift Height of Fork Stacker 1600 mm. 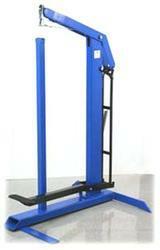 These fork stackers are a very heavy duty construction and are an economical alternative to fork lifts. 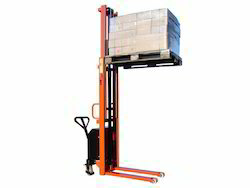 Manual hydraulic lift via pallet truck style handle or foot pedal. Straddle leg model for use with standard 1170 to 1600mm pallets. Lockable wheels are standard on all models. These are basically used for Bulk Material Handling Operations and Intensive Multi shift Operations. They are known for their durability, pollution free functioning, capacity of bearing heavy loads, safe operations and resistance to rust, scratches or wear. Our products meet the industry standards and are highly appreciated by our esteem clients. 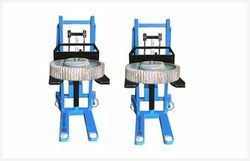 Precision offers Hydraulic Stacker such as hydraulic hand stackers & AC / DC operated stackers is designed for safe and efficient way out for endless material application at distribution center, logistics company and other industries. The entire range is fabricated using latest technology and qualitative material. 1. Collar threads enable easy fixturing Chrome plated plunger resists wear and rust, extending life. 2. Spring return enables fast plunger retraction. 3. Surface coating resists corrosion, extends jack life. 4. SOB-3/ SUF coupler and dust cap are included on all models. 5. There is a stop ring for piston blow out protection. Maximum sized springs speed piston return and also increases spring life. 6. Used for long strokes Vertical & Horizontal application. 7. Saddle, Collar Threads, Bottom mounting holes. 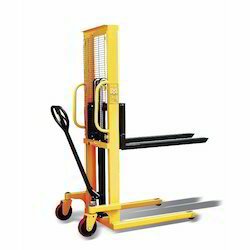 We are the manufacturer of manual Hydraulic Hand Stacker with low maintenance, cost effective material handling equipment which is used in production areas for loading / unloading material from vehicles. We are the manufacturer of Electric Pallet Stackers with low maintenance and cost effective These are basically used for Bulk Material Handling Operations and Intensive Multi shift Operations. They are known for their durability, pollution free functioning, capacity of bearing heavy loads, safe operations and resistance to rust, scratches or wear. Our products meet the industry standards and are highly appreciated by our esteem clients. Our Manual Hydraulic Stackers are designed to meet the demanding tasks of various industries. These are ideal for use in different workstations and industrial applications. Also, these stackers are easy to use and maintenance free in nature. They are incorporated with reliable components and proven technologies. Sturdiness, versatility and safety aspects are well maintained in our Hydraulic Stackers. They have a unique design for easygoing and safer lifting. 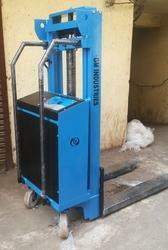 The stackers are used for various lifting works and they offer better stability & efficiency. The applications cover: stacking pallets, loading / unloading etc.